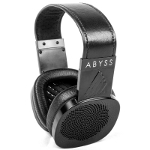 The first presentation, on Europe, of the US-based Abyss headphones brand. Here, the Diana, made of a single piece of aluminum, with soft leather and Alcantara parts. 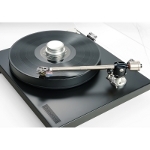 Invictus is Acoustic Signature's top-of-the-range turntable. 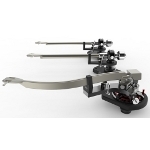 It is an impressive device that can support up to four tonearms, uses six electronically controlled motors and features the company's Tidorfolon bearing. 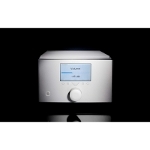 The integrated amplifier of the Advance Acoustic Smart Series includes a balanced input and output, a DAC and Bluetooth streaming capability. Below, is the series' power amp BX1, which delivers 2x105W/8 Ohm (some of them as a class A power stage). After Ensis, this year, Aequo introduced two more loudspeakers. The small floorstander Stilla (with active subwoofer, featuring room correction) and the much larger Diluvium a four-way design which is their flagship. 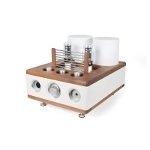 Air Tight showed their ATM-3211 monoblocks, with a power stage featuring two 211 tubes per channel, yielding 120W/6Ω, with the first 30W in class A. The first stages are implemented with 12AX7 and 12BH7. Media One is Alluxity's music server. The server includes a 2TB storage capacity and can either stream from a NAS device or can be used as a NAS via another server. It is based on ReQuest software and features digital inputs and analog outputs. Anthem's STR integrated amplifier, in addition to the standard analog inputs, includes a phono input (MM/MC), digital inputs and incorporates the Anthem Room Correction (ARC) processor. It delivers 200W/400W at 8/4 Ohm loads. 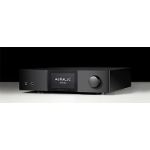 AV860 is Arcam's top AV processor. Supports up to 7.4.1 channels and Dolby Atmos/DTS: X decoding, it handles 4K video signals and offers 7/3 HDMI (ARC) inputs/outputs. It also incorporates the Dirac Live algorithm to control room acoustics. 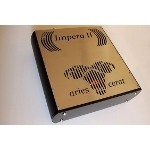 Impera II is the top Aries Cerat preamplifier. It is based on the inverted triode technology developed by the company, which offers some significant advantages when used at the output stage. Frequency response goes up to 500kHz. 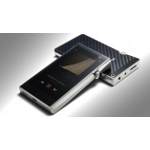 Astell & Kern introduced their new top portable media player. 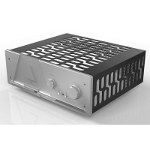 It is called A & Ultima SP1000 features AKM's AK4497EQ DAC and supports PCM 32/384 and DSD files up to 4x. 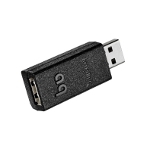 It is compatible with USB 3.0 and has a maximum storage capacity of 512GB. 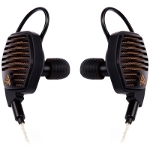 Audeze presented the LCD-i4, a leading in-ear headphone system based on the planar-magnetic LCD-4 technology. 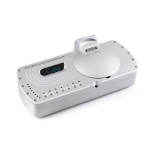 The LCD-i4 outer casing is made of magnesium and the low-frequency response goes down to 10Hz. Audio Union unveiled for the first time the prototype of their new model, Helix 2. It is a suspension-based dual belt drive system, with the power supply integrated into the chassis (the larger Helix 1 uses an external power supply). 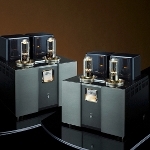 Visitors to the show had the opportunity to listen to Audionet's top pair of amplifiers, the Stern preamplifier (photo) and the Heisenberg monoblock power amps. Both devices are designed by industrial designer Hartmut Esslinger. Audioquest showed, among other things, the Jitterbug, a small device which is placed between the host's USB port and the DAC, with an obvious goal of reducing the jitter. Auralic premiered their new "G" line. 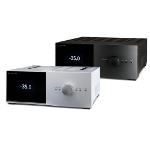 It includes the streaming DAC Vega G2, the Aries G2 streamer, and the LEO G2 master clock. The devices are based on the Auralic's Lightning and Tesla platforms and look quite impressive. First presentation for the new Auris' integrated amplifier, the Fortissimo. It is a 100Wrms push-pull design, based on four KT120 tubes (there will also be versions with EL34s, 6550s, and KT88s), connected either as a standard pentode or in Ultra Linear configuration. 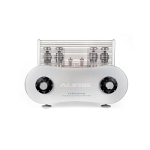 Auris also featured the headphone amplifier Headonia, a single ended design based on 2A3 tubes, delivering 3W. It has two headphone outputs, each of which can be adjusted separately for loads from 32Ω to 600Ω. 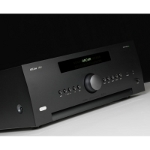 Avid introduced a new pre/power amp pair named Celsus as well as a new integrated amplifier, the Sigsum. 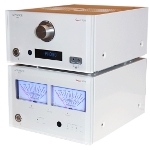 The integrated amplifier has a phono preamplifier and four line inputs. A top quality Alps RK50 potentiometer is featured for level control. The company also displayed the prototypes of the first tonearms of its own design. The models are named Oxytone, Paroxytone and Barytone, have parts made through a Titanium 3D printing process and one of them will be an "S" type. 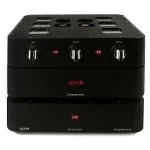 Ayon displayed their top preamplifier, the Conquistador, a design based on four AA45 tubes., Conquistador's production is limited to ten pieces a year. 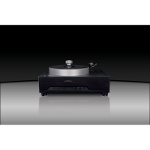 Bryston is one of the well-known manufacturers that invests in vinyl. The result is the BLP-1 analog source. 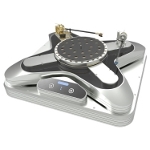 On the occasion of the 40th anniversary of their foundation, Burmester presented their first-ever turntable. 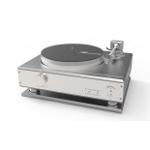 The "175" includes a cartridge, tonearm and a phono stage, all designed by Burmester, and features four motors with an elaborate belt drive scheme. Chord's Blu Mk II was announced earlier this year and is a good demonstration of their design competence in digital audio: Based on Rob Watts' algorithms, the included FPGAs can perform upsampling up to 706.6kHz (16x). 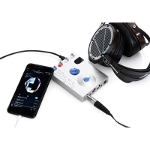 Chord also showed the Hugo 2, a DAC/Headphone amplifier that can be used either as desktop or portable. 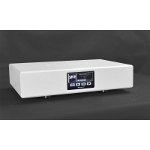 It has four inputs and via its USB port supports 32-bit/768kHz (PCM) and DSD512 (DSD) streams.